Sets up in just seconds with absolutely no assembly required. Simply take the Shade Shack out of the carrying bag and it just pops open. Fill the pockets on the sides with sand, or use the stakes on grass or other surfaces and your ready to enjoy to enjoy the shade. The Shade Shack is made with a zinc coated polyester and has a UPF of 30+ meaning that it blocks over 96% of the suns harmful rays. 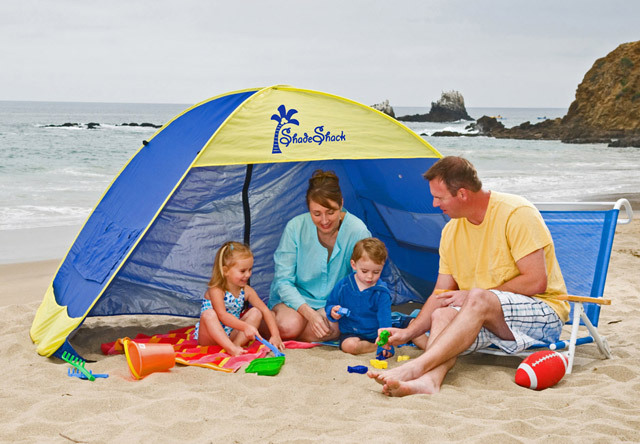 Weighing less that 5 pounds the Shade Shack is easily carried with you any where you go. Get a Shade Shack today and enjoy the ultimate in sun protection! Shipping will be $12 for continental US and $25 for HI and AK. Tax on CA orders only should be 7.5%. Copyright © 2013 Shade Shack All Rights Reserved.